Hi everyone and welcome to second guest blogging weekend! I’ve had such an amazing response and there are lots of fantastic bloggers lined up for you over the coming weeks! I am so excited for this new venture and hope to make it a long running series to get all of you involved! Read until the end to find out how YOU can be involved in my next weekend! For my first post I have a wonderful piece about What to see in Mostar by a wonderful blogger called Georgia! Enjoy! Bosnia-Herzegovina is an almost land locked country in the Balkan Peninsula that has a rich and fascinating history. 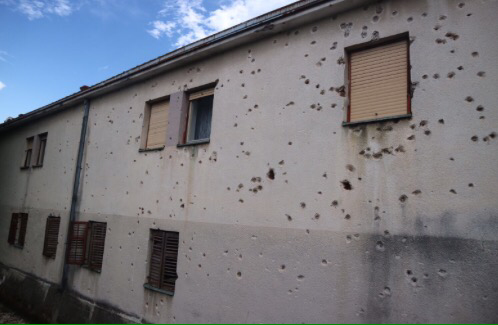 Just over twenty years ago, the country was a battle ground, many of its people fighting for independence from the Yugoslav Federation between 1992 and 1995. 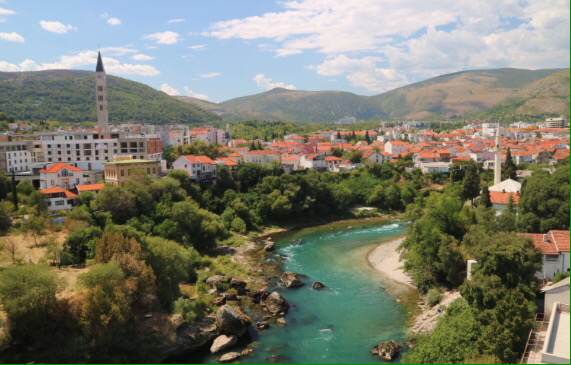 Now, Bosnia-Herzegovina is recovering, and Mostar, the centre of the Herzegovina region, is a city rising in popularity. 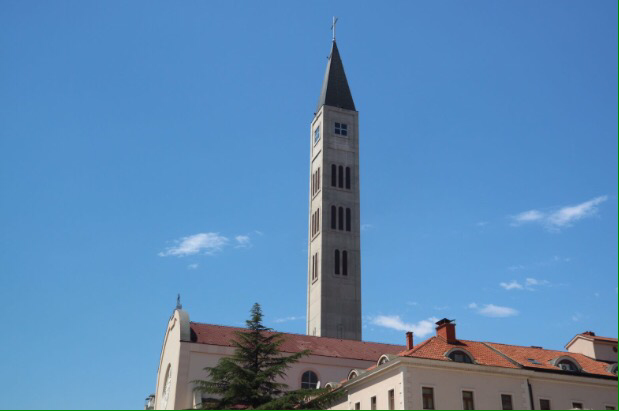 Arguably, it was the centre point of the Croat-Bosniak conflict in 1993, as the city was split between Christians and Muslims, which devastated the architecture and claimed 2000 lives. While travelling to Croatia, I was looking for excursions to go on and places to see. There are hundreds of kiosks in Dubrovnik advertising day trips to Montenegro and Bosnia-Herzegovina, and the grandeur of the ‘Stari Most’ bridge over the Neretva River reeled me in. It’s a real shame we were only there for a couple of hours and could only see the area around the bridge. The currency of Bosnia-Herzegovina is unusual. Their apparent primary currency is Convertible mark, but all places will convert their prices to Euro. In the cities, many shops and restaurants will also accept Croatian Kuna. When we visited in 2017, 1 Euro = 2 Convertible mark = 7.5 Croatian Kuna. Mostar is undoubtedly beautiful from the start. We arrived in the west of the city, parking near ‘Mostarski Zvonik Mira’, the tallest bell tower in the region, which was built after the war to signify peace in the city. There is no way you can get lost parking here and I would recommend it as an emergency meeting point as you can see it from anywhere in the city. By crossing one road, you find yourself in the centre of the old city. Like most old cities, the streets are cobbled and worn. The stones are particularly slippery from years of use, which provided numerous opportunities for entertainment, watching people slip and slide down slopes. Unlike Dubrovnik or Rhodes, the streets are very much alive and bustling with markets selling an array of souvenirs, antiques, and some fabulous hand-made trinkets. 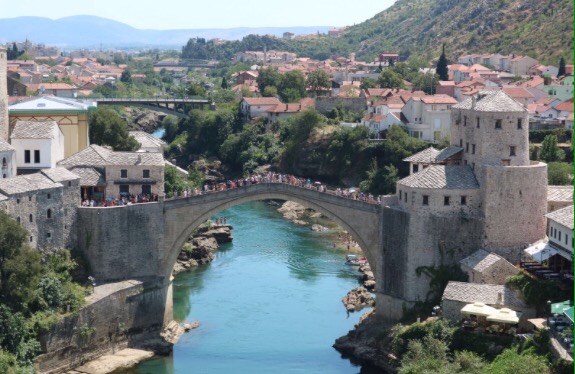 Many people travel to Mostar to see the UNESCO protected Old Bridge. Initially designed and built by the Ottomans in the 16th Century, it is a recognisable landmark, even if you didn’t know what city it was in. Just kidding. That’s the crooked bridge, the Ottoman’s practice run, but just as beautiful. 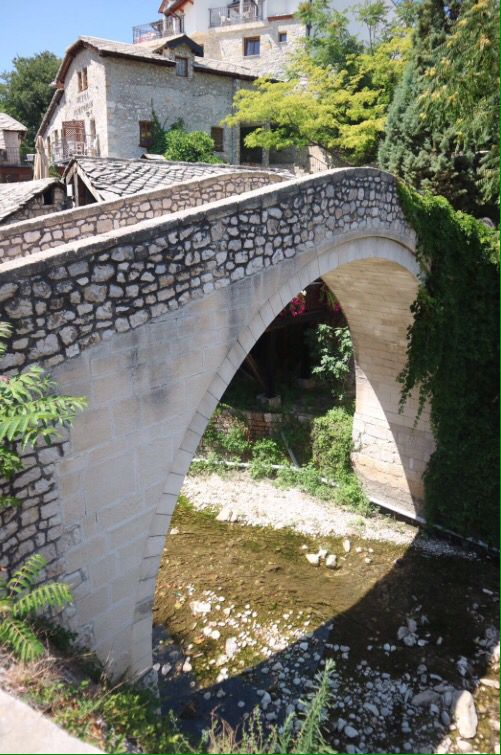 The Old Bridge is magnificent, standing 24m above the stunning but perilous Neretva River, but that’s if you see it from the river bank first. People gather at the banks to watch men jump into the river ‘for a small fee’. Each year, on the last Sunday of July (the day before we visited), many men from the city jump from the bridge. It’s advised against, not just because of the 24m drop, but because of the depth, the hidden caves and whirlpools, and temperature of the river. An Australian girl and I did chuckle when a guide said ‘Women should never jump because it is too dangerous for them.’ We didn’t see anybody jump, but we did enjoy the slightly cooler temperature. Oddly enough, the river is cold, but Mostar is in a valley, with no breeze, and with temperatures that can reach 40c, it is the second hottest place in Europe. It was 38c when we were there, and I was considering getting in that river. If you didn’t make your way to the bank first, you probably wouldn’t realise you were at the bridge until you were on the bridge: on either side there are towers. The western tower completely conceals your view, but does house a museum. I, in shoes with no grip, found it really difficult to walk across, since it’s not flat. The arch you see is literally the arch of the bridge. Combine no grip with perfectly smooth stones and a slight incline, and you will have a problem. On the eastern side, it’s like you’re in a totally different country. Although the buildings look similar, and the markets are the same, there are significant Islamic influences. Most of the mosques in the city are on this side of the river, the shops sell more silks and home-wares with typical Turkish and Arabic patterns. It was on this side of Mostar that I entered my first mosque. As someone who has no religious affiliation, and has only been to churches, visiting a mosque was an unusual but enlightening experience. I had always thought of mosques as places where you just don’t go if you’re not Muslim, but Koski Mehmed Pasha Mosque allows all visitors, regardless of beliefs and surprisingly clothing choice (I removed my hat but felt disrespectful to have my shoulders on show. The people taking care of the place did not seem to mind), to enter the building and climb the minaret for 6 Euros. There is only one staircase, so we had to navigate our way past other visitors, getting slightly too close for comfort. From the top, the view is incredible. On one side you have views of the Stari Most, like a giant Christmas decoration. On the other, the Neretva rushes through from behind a bend, enclosed by greenery, and it gleams like a million sapphires interspersed with turquoise. The sound of the river is like a jet engine, but if you bend down behind the gallery wall, all is silent. Another exciting, but somewhat morbid, thing you can do in Mostar is search for war remains. 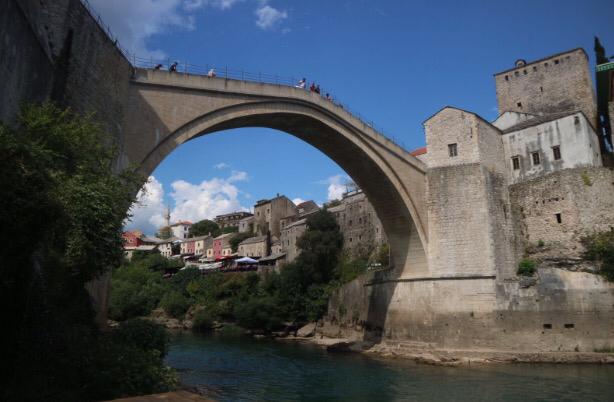 The Stari Most was destroyed in 1993, and large chunks of the nearly 500 year old original structure have been left along the river bank as a symbol of recovery and regeneration. Some buildings have been left completely bombed out and are now left to the mercy of nature. Some buildings, especially those just outside the old city, show obvious attempts of repair, but ultimately have too many bullet holes in them to fix, and continue to function as shops, restaurants, and people’s homes. Before we started the near three hour drive back to Croatia, my partner and I stopped off at Ascinica NAR, a restaurant by the river to have some lunch. Although it was sweltering, we had built up quite an appetite, so we aimed for a full meal, expecting to pay £30 or so. Another shock was in store! For four bottles of soft drinks (Coca Cola and Fanta produced locally), it cost us 12 Convertible marks, so roughly £5.50. For a steak and chips and Ćevapi, a Bosnian style of kebab, it cost us 14 Convertible marks, or £6.50. We bought four drinks and two meals for just £12! Turkish and Bosnian coffees were on sale for just 1.5 convertible marks too. I wish I’d had a bit more time to get one. Mostar tops the list as the most fascinating place I have ever been, and I’ve only seen a quarter of it. If you get the opportunity, take it. You’ll definitely find something we missed. Tomorrow’s guest blogger will be from Denise so make sure you stay tuned for that Sunday 18th January 2019 at 5pm!